As we are all realizing more and more every day, math is one of the fundamental foundations of Science and Innovation. Math is having more impact in our lives especially in the areas of science, technology, and engineering. (STEM's) The better job we do today to educate the youth in our rapidly changing world the more they can have a positive impact, leading to new science, innovation, cures for diseases and so much more. We hope you enjoy this book and let others know about your experience. 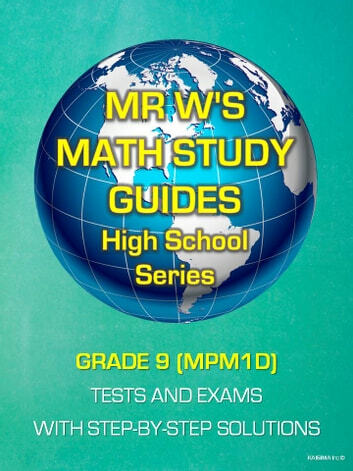 Please don't forget to visit MyMathStudyGuides.com or MyMathStudyGuides on YouTube(TM) to get more information about MR.W's lessons and resource material. Mr. Dennis Weichman is a premier mathematician with invaluable insights and helpful study tips which would benefit students of all abilities. He is a patient and compassionate teacher and helps students focus on maximizing their understanding of mathematical theory and application. Congratulations, Mr. Weichman! Your students will thank you. Best Seller now available as an eBook !! Excited to see Dennis bring his Best Selling Study Guide to the eBook world. I can't wait to see this eBook hit the 5000 sales mark as it has done in hard cover !! Congratulations Mr W !!! The grade 9 book helped me to understand the principle behind the questions.I now could do similar question. My son is currently in grade 9 and has been struggling in math. I tried everything, but then i came across Mr. W's grade 9 Math book and it made all the difference. If you want your child to succeed in math, this book is a MUST have. It shows you step by step solutions to all the problems.